It’s officially September 12th, 2008, the day that the new Hannah Montana bear is released at Build-a-Bear Workshops around the country! 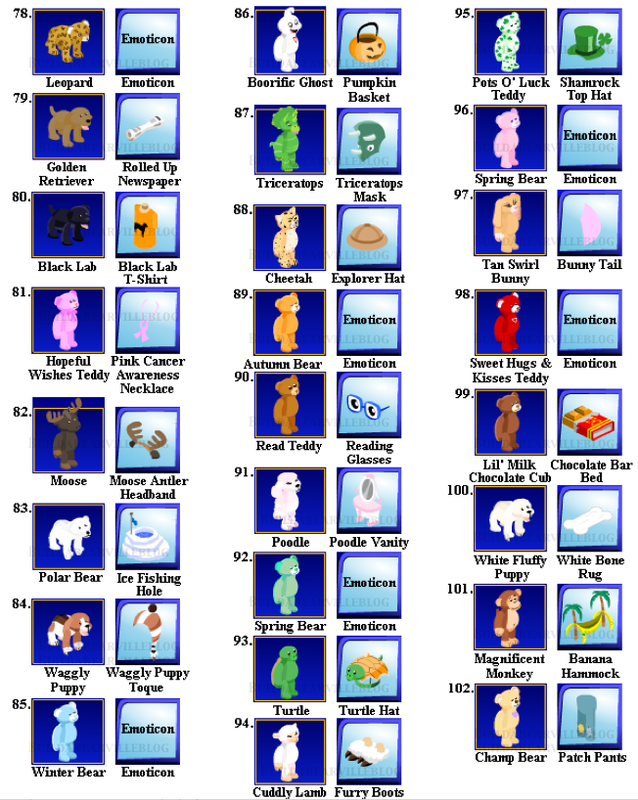 The new bear means a new items in Bearville. 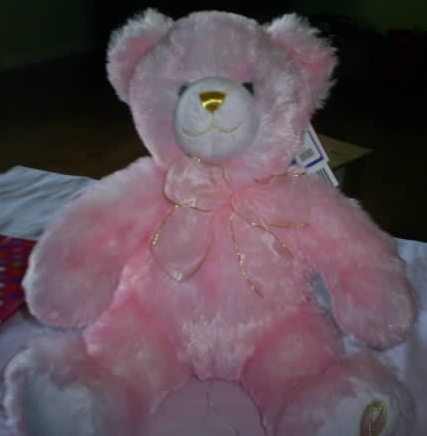 One of our users submitted the following image of the Hannah Montana Bear’s PSI. Of course, the PSI is the "Hannah Montana Stage", very fitting for the bear, and is shown below in an exclusive screenshot! In addition, they sent us a picture of the bear’s special wallpaper: Electric Guitars!! UPDATE: Our very own Founder, Freya adopted her own Hannah Montana Bear and gave us some pictures!! It’s official, the new Arts Center has been redesigned to look like a Hannah Montana stage! The Hannah Bear is there and Addball1516 reports clicking on the Hannah Bear will get you the Groove dance move! The New Dance Sequence Move is working, click on the gold star! You can save more than one! A few weeks ago, a purple sign appeared in the neighborhood and several various places around Build a Bear Ville. The mysterious proclamation, announced that on September 1st, you can put on your own rockin’ dance show at the Pawforming Arts Center! Rumor was that the theater would be redone in a Hannah Montana theme. Early this morning, Freya posted a picture of the newly remodeled stage. It was indeed redone in the Hannah Montana style complete with guitars, a drum set, and the Hannah Montana Bear! Addball1516 got a new move when she clicked on the bear! The hot-off-the-press edition of the Furry Newsflash said that we can get a new gift each week! Although the “Groove” is still not working for some, the Move Sequencer has returned! It is now being called Build a Dance and is fully functional for most people. You can program which dances you want to do in a sequence, and then preview before you are done! Today, Build a Bear Ville’s servers were up and running, and very busy! Almost all of the servers were full! This was because of the numerous Maxine CEB and Chloe Rocks sightings! In previous meetings Maxine had revealed some information about the next gift she would be handing out! She said that this gift would be enjoyed by both boys and girls. Bloggers guessed and guessed but MelindaSnowflake2′s first guess was correct! Maxine’s new gift is a blue Bear Head Watch! As usual, people flocked around Maxine begging her to add them. After a while Maxine left and Chloe Rocks came on the scene! She too had a new gift, this time for Back to School! Chloe talked about going to school and that she thought the new Book Strap would be handy. She visited various places in Build A Bear Ville, and also visited the Chloe Show! Chloe promised new episodes and interviews soon to come. Before leaving, ChloeRocks excused herself while she had a “conversation” to Maxine on her cell phone. She typed her conversation so we could “hear it.” From what I heard, Maxine, Bearemy and gang were going to have a Barbecue at Maxine’s house tonight! JailynVolleyball shared that JaoCybearguide hinted at new Fountain Prizes tomorrow! Who knows!! We will have to wait and see! This has been an exciting busy day for Bearville Insiders, and especially for the technical master minds of BABV! Thanks to everyone who pointed out new editions! If you would like to comment or add to this article please register at the forum and comment in the ‘Blog Articles’ Forum. Click HERE to register. The newest Build-A-Bear Beaver has been brought to life online by BuildabearvilleBLOG member KrissyBearDiva14′s friend MercedesAdorable20! By using the birth certificate animal ID and key code to bring your Furry Friend to life on line you receive a Virtual Gift and extra Bear Bills! The virtual gift that comes with the Beaver appears to be a Log Chair! Her screenshot of the new Beaver, wallpaper and Log Chair follow. Thanks for sharing this exciting news with us KrissyBearDiva14! Hopeful Wishes Teddy II is part of the Build-A-Bear Workshop cause-related bear family. When you make a cause-related friend a portion of the proceeds is donated by BABW to help their cause. Hopeful Wishes Teddy I (HWT I) was introduced in August 2001. She is a 16 inch bear with pink tipped, fluffy fur and brown eyes. 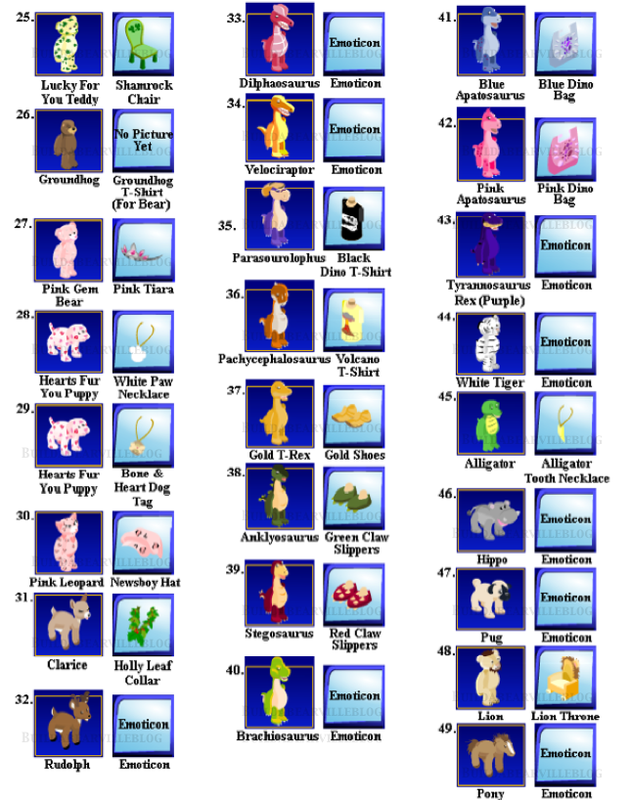 There are currently two HWT I bears to choose from at Build-A-Bear Workshop online. The BABW website shows that HWT I (SKU 2116) comes with a pink enamel ribbon breast cancer awareness pin and $1 of the purchase is donated to advance breast cancer research, education, screening and treatment. One other HWT I (SKU 2092) is available, on the BABW website, and it does not indicate that a pin comes with the purchase but it does say that $5 is donated from the sale of this friend to advance breast cancer education, research and to help support groups. Hopeful Wishes Teddy I is available to bring to life in Buildabearville. When brought to life between December 2007 until recently the Virtual gift exclusive to this bear was a pink cancer awareness ribbon necklace for your character/avatar to wear. Members have recently reported getting a brown and white bone/dog tag necklace instead, much like the one that comes with one of the Hearts Fur You Puppies. Hopeful Wishes Teddy II (SKU 13708) on the BABW website shows that $5 is donated from the sale to advance breast cancer education, research and support groups. This bears will be available for purchase in stores in October per a recent update from KarenBearHug and HopeBear162! The newest Build-A-Bear Zebra has been brought to life online by BuildabearvilleBLOG member KylieFurbulousPal! The virtual gift that comes with the Zebra appears to be a Street Sign! 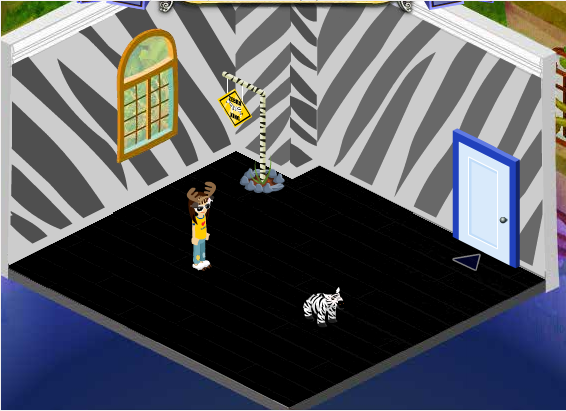 Her screenshot of the new Zebra, striped wallpaper and Street Sign follow. Thanks for sharing this exciting news with us KylieFurbulousPal! On August 13th, every member in Build-A-Bear-Ville received a message from ChloeRocks! The friendly reminder promised new clothes, styles, furniture, and even two new Cub Condo rooms! BuildabearvilleBLOG buzzed with excitement, mystery and wonder in anticipation for new additions. Some faithful bloggers stayed up all night to get the early bird sneak peek, only to be disappointed that Build a Bear was under construction. Kristendiva18 noticed that you can sit on furniture that you couldn’t before! When your character reclines, he/she puts her hands behind her head. Furry friends kick their feet when they lie back in lawn chairs! HopeBear162 spotted a colorful bunch of four, bear-headed balloons. Although many speculated that they would be the surprise Birthday gift celebrating Bereamy’s birthday, Janineallheart6 was the first to discover that the giveaway was not the balloon cluster but an adorable cupcake hat with a red candle on it! Were the balloons a glitch or will they be given out during Bearemy’s Birthday celebration? Only time will tell! The tour guide for the Build A Bear Ville tour is no longer furry Bearemy but ChloeRocks herself. One of the cons is that you can not exit the tour but must listen to the whole thing. LindaFriendly discovered that your bears can walk outside of your condo! MelindaSnowflake2 was shocked when she found her bear eating an apple outside of her condo! Not only can your furry friend eat apples, but your character can buy apples and some other school supplies such as lunch boxes at the Pawlette Boutique! Along with the cool, back-to-school accessories, a new set of school clothing was added in the Pawlette and also Bear Boutique! It wouldn’t be complete without new furniture like world maps, globes, chemistry sets and more! Be sure to pick up some school supplies today! The Furry Newsflash brought exciting information concerning one of the biggest mysteries Build A Bear Ville Blog has seen! There was an exclusive interview with Maxine Clark who revealed that Jr. Cybearguide hopefuls will have to pass a quiz of ten questions. Maxine also recommends that you go to BABW a lot and have at least one furry friend! The hat for Cybearguides has a blue star above it unlike the white question mark that official Cybearguides own. Many bloggers can not wait until Mid-September! The Newsflash also mentioned that photos taken at the photo booth will be able to hung in your Cub Condo! Zazzle will be even offering to print your pictures into real t-shirts for you and your furry friends! Thanks to everyone who helped fellow bloggers find the solutions and answers to glitches! Another big thanks to everyone who contributed information that was not easily seen! Hi! This is reporter, Joe cool, here with some breaking news! BABV may be hinting at new WORLDS to be added to Buildabearville! We have this info from a VERY reliable source: BABV ITSELF!!!!! When you click on the ??? 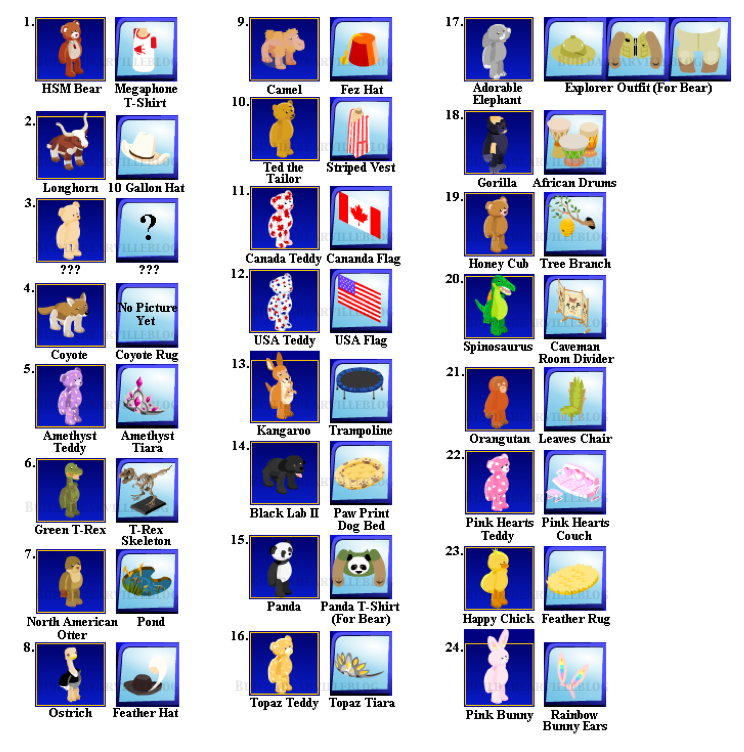 icon, at the top of your screen in Buildabearville, and choose the FAQ from the drop down menu, you will see the pictures shown below. Is BABV hinting at possible NEW WORLDS?!!!! If you look at the picture below you have possible new worlds on a bear shaped planet! Wait this just in……. We have a report that YOU can soon buy clothes for your furry friends WITH BearBills. We have found this under the BB section of the ? This is all from a VERY RELIABLE SOURCE: BABV ITSELF!!! Below is our evidence. This is Joecool signing off, Good Night. 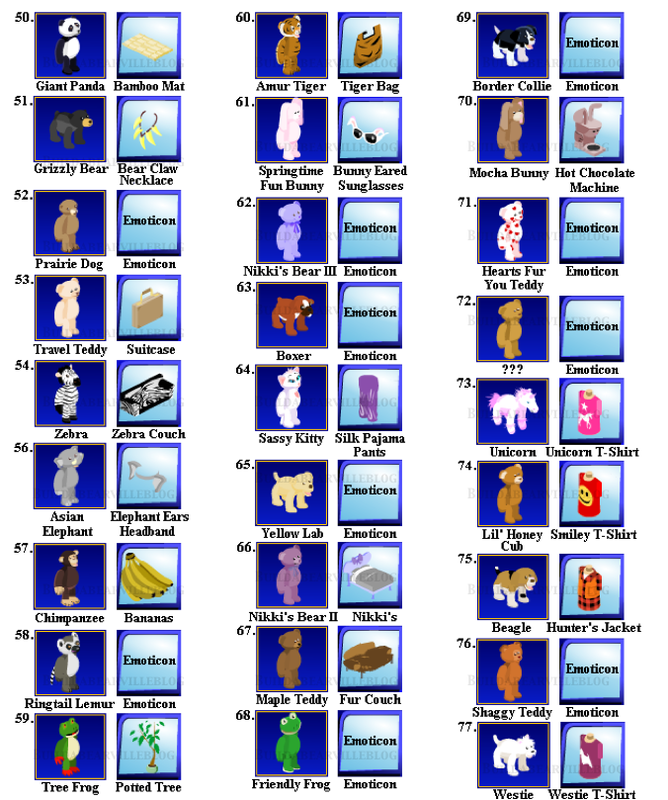 Big changes were observed for the August 14th update of Build-A-Bearville! JessBearHug noted that the Login feature’s appearance changed! So, for all of you BABV families and users with side accounts, you can click on the ‘Remember Me Next Time’ button while logging in on your different accounts, because instead of only one account being remembered, all of them are! LindaFriendly reminded us all to visit the Lumbear Yard to buy one (or both) of the new rooms that were added today: The dorm room, and the outdoor patio! Adding these two rooms to your ‘Cub Condo’ changes the layout of your ‘Cub Condo Map’. You can enter the dorm room through your main room, and you can enter the patio through your kitchen. MelindaSnowflake2 noted that the patio was a little expensive, but was definitely worth the price of 5000 Bear-Bills. For a little while, there was a ‘Move Sequencer’ in the Pawforming Arts Center, where you could select up to ten moves that you would like to do in a row. When you would click accept, the sequence would show up in your moves! You could only make three sequences. Sadly, this feature disappeared. But, could it have been a sneak peek into the future of Build-A-BearVille? We will just have to wait to find out! JohnWalt discovered some exciting news: Build-A-BearVille is no longer in the Beta stage! Some still see the Beta in their browser address. ChantelleFurshion discovered a new item; a cluster of four bear-head balloons! ReganSoSweet likes how the balloons are in a big bundle, instead of only one balloon. Will this be Bearemy’s birthday gift to us? We’ll find out tomorrow! We can also now place furniture on the outside of our house! JenniferLoveable said that her furniture disappeared when she put it in the front yard of her house. But, that glitch was only temporary and was fixed quickly! AaronGamer told us about the new flag in the Bear Stuff Store: An Olympics Flag! And the biggest news of today was the addition of new clothes at the Pawlette Cofur Boutique, and the new school-themed furniture from the Bear Stuff store! RachelCurlyFur9 reminded us to check out the new clothes for you and your bear at the bear boutique, too! A special thanks to all of you who contributed to the ‘News Flash’ section in the forums and helped us figure out all of the new changes and new features in Build-A-BearVille! Inclusion of this list is currently being reviewed by staff.